Made for 6mm threaded screw on tips and slip tip adapters, these threaded, high profile sharkfin tab spears are made specifically for open muzzle spearguns and Enclosed Track Spearguns. 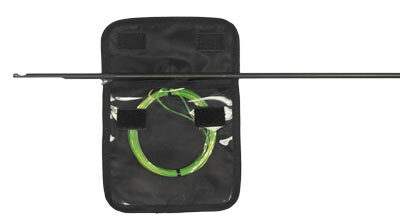 These Mako Spearguns Carbon Spring Steel spears are arguably the strongest spears on the planet. They are by far stronger than stainless steel spears and by making them with high profile sharkfin tabs, they are even stronger. Spears with sharkfin tabs (built for open muzzle guns) are 50% stronger than notched spears. This is particularly important for longer spears. NOTE: Threaded spears are slightly shorter than standard spears to accommodate the added length of the screw on tip or slip tip adapter. NOTE: The required spear length should be 40cm longer than your speargun barrel. For example, the proper spear length for a 120cm gun is 160cm. Clear product...put a simple note down on what I wanted it rigged like and they far exceeded. Thanks guys! Great shafts. They are stiff, strong and shoot laser straight. Only complaint is that the two I got were packed side by side without any covering so the shark fin tabs did gouged eachother. It created patches of exposed high carbon steel that could corrode. I have a DIY shaft electroplating setup, so I just replated the areas on both shafts. Maybe more care in shipping, but I love these shafts and the price! Fantastic quality product, craftsmanship is top notch. Exactly what I wanted. Back that up with the best prices and best customer service you can find.